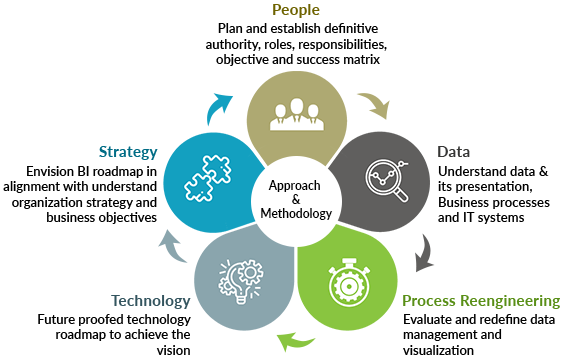 GrayMatter synthesizes a Business-IT road-map driven BI strategy for its customers and delivers the same through a sharp focus on the four pillars of People, Process, Data & Technology. GrayMatter SAP BI Analytics team has a distinct focus on SAP BO Business Objects with functional and technical experts that has delivered business value to marquee customers across verticals like Retail, Electronics, Manufacturing, IT, Airports & Infrastructure and so on..
GrayMatter’s vast experience in SAP Business Intelligence Analytics implementation across industries & geographies provides the ideal background to utilize the SAP BI Analytics platform. Here is a brief snapshot of our work in SAP BI space across industries worldwide. Key Analytics focus: Data security is key for the financial services industry especially in Banking & Insurance sector. Detecting and preventing fraud is another focus of this industry. Customer analytics, marketing analytics, portfolio, credit risk, fraud & risk analytics, pricing models, demand forecasting, cross and up sell models, churn modelling, loyalty & claims analytics are some key focus areas for this industry. Key Analytics focus: The online digital onslaught came upon the media & entertainment industry suddenly and hence the biggest challenge just became worse. That is the pressures as well as opportunities presented by distribution and consumption of digital content. Key would be monitoring consumption patterns and evolving constantly would involve very complex big data analytics play which very few would be able to deliver. Demand signaling, sentiment analysis, targeted advertising analytics, customer acquisition are other key focus areas. Key Analytics focus: Constantly increasing pressures on margin, global supply-chain evolution, lack of critical workforce, customer loyalty, pricing mechanism and product design based on what the customer really needs for today and the future are the main challenges faced by today’s evolved manufacturing sector. SAP Business Intelligence Analytics coupled with advanced analytics and predictive modelling is the proven answer for this industry. Focus being Supply-chain, logistics and inventory management, demand forecasting and SKU rationalisation, process and quality analysis, engineering analytics, predictive maintenance. Key Analytics focus: In the retail industry today consumer behaviour understanding using analytics to drive loyalty and customer engagement is pivotal. Some of the analytics focus areas in Retail are as follows merchandising analytics, customer analytics, churn analytics, inventory management, supply-chain optimisation, sales performance analysis, market mix modeling, CRM analytics, fraud detection and prevention. Key Analytics focus: Some of the concern areas tackled through analytics by GrayMatter for transportation and logistics industry are supply chain planning, warehouse optimization, routes optimization and operational efficiencies. For Airports the consolidation of data across multiple stakeholders across airside, terminal, aero and non-aero is so important today due information stored in complete isolation among multiple entities. Key Analytics focus: Cell site optimization, revenue assurance, customer profitability analysis, network dynamics, congestion control and social network analysis, customer satisfaction and attracting new subscribers have been addressed by GrayMatter team earlier. The telecom sector is using analytics to protect customers from churn with clinical marketing programs for identified customers besides network security management. Other analytics focus include fraud prevention, campaign management, churn prevention & pricing models. Key Analytics focus: Depending on the size, demographics and stage of development Government’s world over have varying pain areas and use cases to contend with. While planning, census monitoring, homeland security, fraud detection and health care management are areas that can be enhanced with the help of big data analytics, at GrayMatter we have already achieved some of these outcomes for varying government agencies globally.